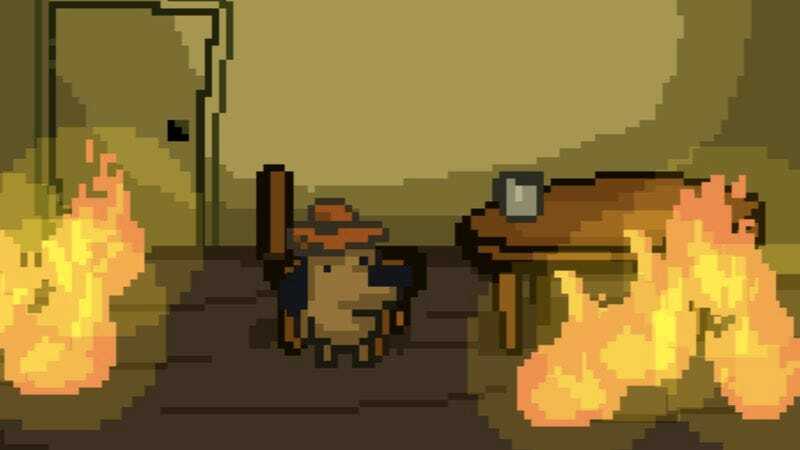 A dog sits in a flaming house. It wears a tiny hat and an absent smile. “This is fine,” it says. It was just two panels, but KC Green’s illustration somehow came to be one of the definitive memes of 2016, a year defined by our distaste for it. Taking the meme’s malleable themes a step further is a new, free game from developer Nick Kaman. Kaman has cited the comic as a direct inspiration, with the game even starring the meme’s clueless dog. In the game, however, it’s not so clueless. Armed with a fire extinguisher that spews bubbling pink hearts, the game tasks you with extinguishing the flames. The thing is, not all the flames can be extinguished. And when you fail to fully clear the house, a melancholy refrain underscores the arrival of a motley crew of friends, one of whom is also on fire. As you extinguish your friend, the others use the fire to roast marshmallows and smoke a pipe. The flames, whether we like it or not, have become interwoven with our daily life. Outside, they ravage the countryside as bunnies ice-skate and a pig makes a snow angel. So, yeah, there’s not a lot of gameplay. There’s no final boss, no giant, bellowing Trump to conquer. There is a lot of heart, however, as well as a message that points to the importance of friendship and community in times of strife. That’s a message worth remembering, even if it comes from an unexpected place.